Wash and cut the stems and tips from the okras, discard them. If you want, you can cut them into slices or cook them whole. Boil in one cup of water for approximately 8 minutes. Add the oil to another pot and sauté the ham until it browns, add the onion and garlic, cook for 2 minutes at medium-low heat. Add the pepper, the seasoning, the okra and part of the water in which you boiled it. Add the rice, salt, and when it begins to boil set the heat to low, cover when it's well cooked. You can add vegetables and red chorizo. Remember the amount of water you use to cook the rice depends on the size of the grain. If you're using short or medium-sized grain, use 1 cup of water per every cup of rice. If you choose long-grain rice, add 2 cups of water for every cup of rice. 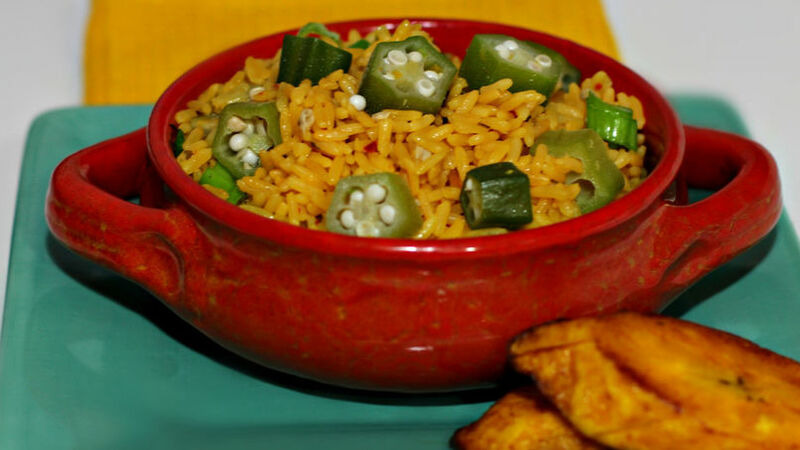 It's been a very long time since I prepared this rice with okra, another recipe handed down to me from my mother. She would prepare is so well and I really enjoyed it because it was different from the rice she usually prepared and I always tell her to prepare it for me when I visit. Besides sharing this meal, we also have fun together in the kitchen, a way to unify us even more. This recipe is quite simple, but the aroma and flavor are delicious.